Growing concerns in health care facilities regarding the spread of germs are sparking a new add-in to routine maintenance: Antibacterial wipes are now being used by more facilities to supplement cleaning between custodial schedules. When spills, sneezes and other unplanned messes happen, strategically placed antibacterial wipes on hand is helping to reduce the spread of germs while increasing overall cleanliness. Encouraging and training non-custodial staff to use antibacterial wipes for interim cleaning is vital for optimum cleanliness. Teaching your staff when and how to use these wipes can include watching for sneezing patients and visitors, wiping electronics and equipment down after use and even timed cleanings for high traffic areas. Interim cleaning using antibacterial wipes ensures a healthier environment for both patients and staff. Key areas that should have antibacterial wipes within reach include high traffic areas such as nurses’ stations and reception areas as well as workstations. Having wipes in these areas insures that both equipment and counter and desktops stay clean between scheduled custodial cleanings. Antibacterial wipes that do not contain alcohol are available for cleaning monitors and other electronic equipment that can be damaged by using antibacterial wipes containing alcohol. Launching a successful interim cleaning campaign within your facility should include educating your staff and residents (if applicable). Long-term care and assisted living facilities throughout the United States have found that implementing these programs keeps both staff and residents healthy and productive. Clinics and hospitals can also benefit from having antibacterial wipes at the ready for unexpected messes. 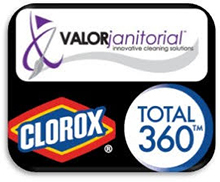 Regardless of facility size, antibacterial wipes are an economical cleaning solution that is safe and manageable.